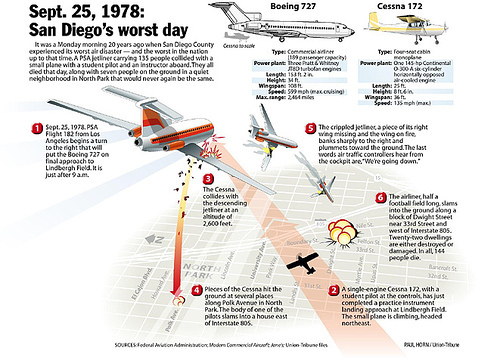 Remarkable image by Hans Wendt, who at the time of the crash was a County of San Diego County Photographer. Other images: SD news media. 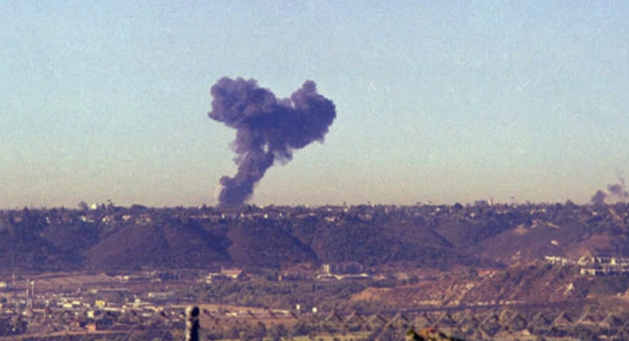 “…THIS IS IT!”—By Thomas Shess--The most memorable day in San Diego’s collective psyche, September 25, 1978, turned out to be a 101-degree scorcher, the most stifling and smoggiest day of the year. At 9 a.m., however, the sky was clear, the temperature just hitting 80 degrees. An idyllic California morning. Editor’s note: The time references are for 1998, the date this article was first published in San Diego Magazine. The report won Best of Show in the 1999 Society of Professional Journalists for the writer. Looking West on Dwight St. at Nile St. Almost 20 years later, radio executive Joe Gillespie says: “I remember that day as if it happened yesterday.” Two decades ago, Gillespie was news director at KSDO Radio. Today, he’s the station manager for WLAP in Lexington, Kentucky. “It was too perfect a day. There was no way you’d expect a PSA jet to fall out of the sky. I mean, you could see forever,” he says. 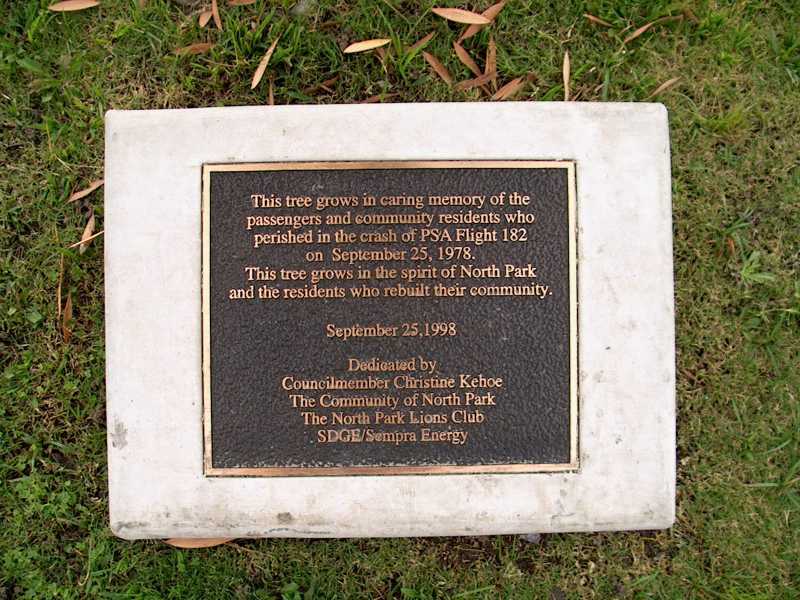 Fall out of the sky is exactly what Pacific Southwest Airlines Flight 182 from Sacramento via Los Angeles did—after it collided with a single-engine Cessna some 2,600 feet above the Mid-City intersection of 38th Street and El Cajon Boulevard. 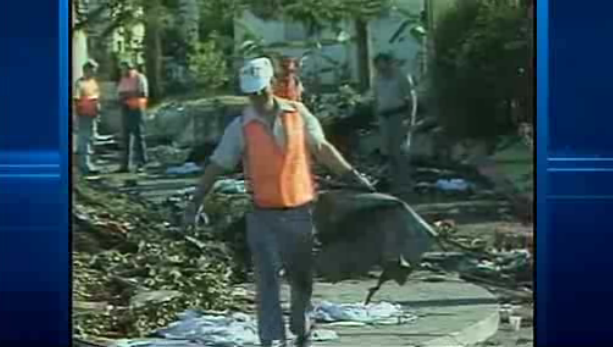 Pieces of the Cessna, with its two-man crew, crashed at 32nd and Polk streets in the heart of North Park, an eclectic mix of shopkeepers and working-class residents, a few miles from the San Diego Zoo. 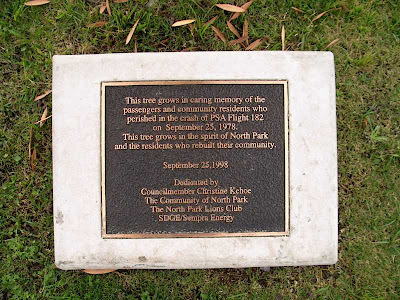 Ground zero for PSA’s 150,000-pound 727-214 was Dwight and Nile streets, just west of Interstate 805, only 3 nautical miles northeast of Lindbergh Field. Flight recorder data showed the collision happened at 1 minute, 47 seconds after 9. Flight 182’s impact with the ground was documented 3!10ths of a second past 9:02. From resounding collision to fiery aftermath, the elapsed time was just 17 seconds. 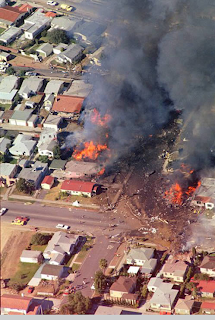 Two hours after the worst of the horrific black-and-orange smoke cleared, PSA management and investigating officials reported that no one aboard had survived the passenger jet’s 300 mph plunge into the residential neighborhood. By noon, the world knew of the tragedy—the highest air disaster death toll ever in the United States. All 135 aboard the Boeing jetliner perished, as well as two in the Cessna and seven persons on the ground. Only a few bodies were even recognizable as human. Gary Jaus, a rookie cop at San Diego Police Academy, was one of 15 in his class given the somber duty of combing through the wreckage for anything that could be used to I.D. a victim. Today, Jaus is a sergeant in charge of community policing. Bodies were crushed in the remains of an Audi, where a couple died on the spot as they were driving. One body slammed through the windshield of a car. Blood was all over the hysterical driver and her baby. Bodies were on rooftops. Slammed against trees. Gore was splattered on exterior and interior walls of homes. In a small daycare center next to ground zero, the 33-year-old caregiver and mother was killed, as were several children. “Man, do I have to tell you it was horrible?” asks the veteran cop, his lower lip trembling. “It was gruesome. The heat of the fires and the sun made the whole scene surreal. We couldn’t drink enough water. All around us was the stench of kerosene and burning flesh. 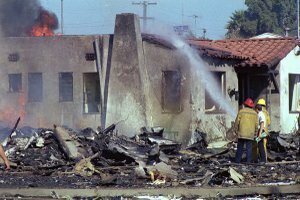 We did our job by rote, locating the pieces so the SWAT team could mark the spot and cover the body parts.” Shown a yellowed copy of the San Diego Evening Tribune, he notices a story about an older woman who was talking on the phone with her sister when the jetliner exploded on her house. Jaus puts his hands to his face briefly, glances out a nearby window and speaks very slowly and softly. About noon that day, he and fellow rookie cops had stumbled on the charred door of a gutted residence. 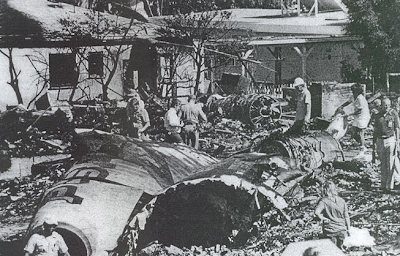 More than 140 eyewitnesses to the midair collision and resulting ground-level devastation would be documented—a chilling number, considering it almost matched the death toll. In the end, fewer than a dozen were deemed credible. Among those witnesses were several on-duty firemen, who saw the disaster from two different locations. Firefighters, along with police and surviving local residents, saved many lives by bravely entering flaming houses to rescue trapped victims. North Park–based Engine Company 14 was parked at Morley Field on the northern edge of Balboa Park. Four members of the company (one truck) were exercising along Upas Street. Engineer/driver John Allen was jogging when he heard a huge popping noise. It made him jerk his head around and look up into the sky. 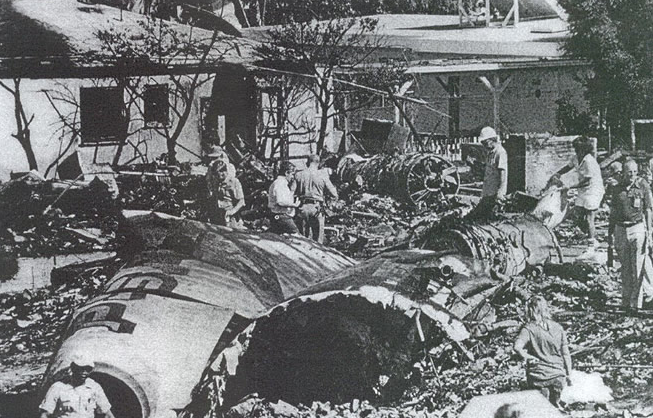 He saw the aftermath of the midair collision, which later reports would say was virtually head-on. Pieces of the Cessna’s propeller were embedded in the right wing of the 727. The impact ruptured fuel and hydraulic lines, causing a massive explosion. Allen grabbed the two-way radio he carried with him. He remembers being out of breath from running as he called in one of the first eyewitness reports from the field. “Engine 14, we’re responding,” he recalls repeating several times to a disbelieving San Diego Fire Department dispatcher, who thought at first Allen was reporting a car fire. Allen and the rest of his company scrambled to their truck and raced to the fireball only blocks away. Another key set of eyes saw the disaster seconds after the collision. “I saw something fall away from the big plane,” remembers Robert Osby, then a battalion chief with the SDFD. Osby was at the inferno within minutes. En route, he was able to radio a confirmation of Allen’s call to the fire department’s dispatch. The alertness of Station 14 provided immediate equipment at the fire. Osby’s arrival gave needed leadership to rescue efforts already under way. Now San Diego’s fire chief, 61-year-old Osby is a native of San Diego and a career fireman. He graduated from Stockton (now Martin Luther King Jr.) Memorial Academy, San Diego High and SDSU. But nothing prepared him for what he witnessed in late September 1978. “About 9 a.m., I was standing outside Fire Station 28 in Kearny Mesa. I was standing with my back to the station and facing toward Montgomery Field. We were discussing upcoming training procedures. Nobody wanted to go inside. It was already too hot. “Then I could see the eyes of one of the men sort of drift away. I knew he wasn’t listening to me—so I followed his eyes up into the sky. “‘Oh, jeez, did you see that!’ I shouted. “‘What was that?’ the other man demanded. “‘Damn, the engine fell off the wing,’ I said. “I saw a puff of white smoke or steam, then what I thought was an engine fell straight to the ground. I saw it very clearly. I knew it was a jetliner, but I had no idea it was PSA. Osby jumped in his red car and fumbled for his “Kojak light,” the portable emergency flasher placed on the roof. Radioing what he saw to the dispatcher, he tore down I-805 south to the site of black, billowing smoke. Mentally, he was setting up plans for a command post. He knew he would likely be the first ranking fire officer to arrive. “I parked away from the scene,” he recalls, “far enough so I wouldn’t run over hoses on the way out. For the fire command post, I picked a parking lot near the drugstore [Sav-On] at University and 32nd. From there, I figured we could progress safely. “I jogged to the scene. From my side of the fire [north], I was ahead of any fire [department] engines, although I could hear them approaching. I was facing a huge wall of flames, and black smoke was everywhere. I saw a TV crew already there. I couldn’t believe it. I saw police and residents climbing into burning houses to look for victims. Unbelievably, I saw a U.S. Navy fire engine already on the scene. It was trying to get water out of a hydrant, but the water main had been ruptured. 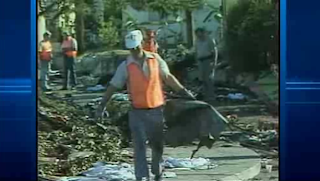 Much later, Osby learned that crash investigators were amazed at how small the disaster site was. Only two sides of one short block of Dwight Street were devastated. Osby vividly remembers details that ran through his mind as he ran up to the grisly scene. “The first thing I saw was the huge tail section that said PSA. I remember saying, ‘Damn! That’s San Diego’s airline; that’s one of ours.’ To this day, I haven’t felt such a sinking sensation in my stomach. I became nauseous—not because I was starting to see dead bodies and body parts all around me, but for the simple reason that these were living human beings only moments before. “I had no hose, and because I was a training officer, I made myself a lookout for the arriving fire crews. I kept telling them where the downed power lines were. I remember shouting for civilians to get away from the bodies. The neighbors just wanted to help by putting cloths and blankets over dead bodies. But we couldn’t let them, because there might still be pools of jet fuel or live power lines next to those bodies. I shouted a streak to keep people away, and I know many couldn’t understand why I was raging at them. John Britton had been on the job five years as a TV journalist when he was assigned by the local NBC affiliate to cover a photo-op story for Lucille Moore, then president of the County Board of Supervisors. Channel 39 cameraman Steve Howell was with Britton, along with a handful of other reporters. The county press event was held at a Go-Lo service station located at University Avenue and Boundary Street, adjacent to I-805. The time was about 9 a.m. Hans Wendt, a staff photographer with the county’s public relations office, was in the background, holding his Nikkormat EL 35mm camera and ready to snap a shot. He had stepped back to get a better view of the crowd. The fact that he was farther back and out from under the service station’s overhang would be extremely important a few seconds later. Channel 39’s Howell was shooting with color film, pointing his shoulder-mounted camera at Supervisor Moore and Britton, who was holding a microphone to her face. The press gathering heard the grinding crash and explosion. So did Warren McKenna, another witness, who says the Radio Shack he was working in shook as if it were in an earthquake, and the sound was so loud it emptied the store at I-805 and University. 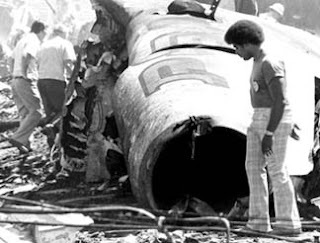 Howell spun around after he heard the initial midair collision, his camera still recording. He glanced up and pointed his lens in the direction of the falling Cessna. “I’m still amazed that we got that footage,” says Britton, now a public relations spokesman for Pacific Bell in San Francisco. That fearsome footage, a staple of countless TV stories about the crash, no doubt will be seen often this September as the crash anniversary is reached. 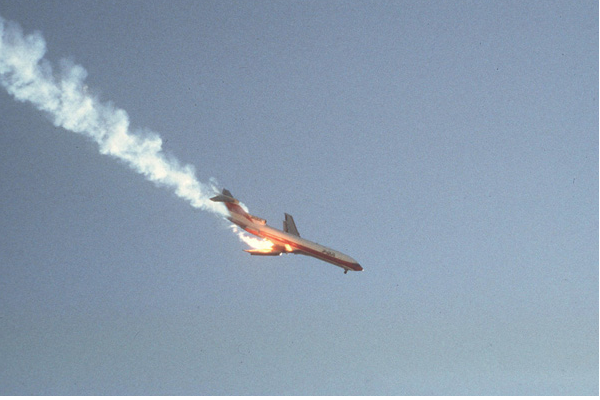 As Howell was capturing the Cessna’s death spiral, Hans Wendt was training his 35mm camera on the flames and trailing blue-and-white smoke streaking from the right wing of the 727. The county photographer later discovered he had captured two vivid color photographs of the jet’s final moments. The following day, Wendt’s shot appeared on page 1 of The San Diego Union and in newspapers around the world. The all-too-vivid photo also made the cover of other publications, including Time. By the time Britton looked around, Howell was running down Boundary Street with his camera continuing to roll. Britton knew his colleague would need more film magazines, so he jumped in his car and followed him. The Evening Tribune heard about the crash from a telephone tip, says a former reporter. The afternoon daily was an hour and a half from its usual deadline. The entire newsroom quickly mobilized and managed to put a remarkably comprehensive edition out on time. Much of the focus of the Trib’s newsroom centered around the city desk editor at the time. Jim Nichols, later praised as “one helluva rewrite man,” wrote the cover story under a huge banner headline: “AIR TRAGEDY! Worst U.S. crash kills 140 here; 10 homes set afire by jet debris.” The one-column story snaked down the page next to an amazing aerial color photograph of PSA’s ground zero by the Trib’s Thane McIntosh. 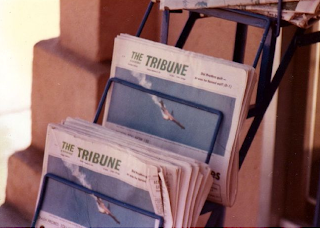 That hour-and-a-half newsroom effort earned the Tribune its first Pulitzer Prize. From the late 1940s and into the ’50s, PSA was known affectionately as the Poor Sailor’s Airline. Headquartered at Lindbergh Field, PSA popularized commuter flying. Few of its flights were more than an hour long (so no meals were served), fares were cheap, and the flying was fun. When the jet age came to commercial flying, PSA took to the new 737 and 727 service with its trademark smile. It catered to the day-in-and-day-out business commuter. By 1974, the airline had gone into a frenzy of expansion, with hotels, radio stations and big new L-1011 jumbo jets. Then the oil crisis hit. PSA profits shrank to match the legendary shortness of its female flight attendants’ skirts. In 1978, Bill Hastings was a veteran of five years in the PSA corporate public relations office. He had gone straight from SDSU to the original low-fare “airline with a smile.” On September 25, 1978, the PR brass had sent Hastings to Sacramento on an early-morning flight to discuss safe flying on a TV show. When Hastings arrived at Sacramento Metropolitan Airport, he grabbed a company line and called his boss, Duane Youngbar, who was head of corporate PR for the publicly held company. The time was about 9 a.m.
Two decades later, Hastings easily remembers the conversation. Hastings took the next flight back to San Diego, knowing only that one of PSA’s “grinning birds” had gone down. “I had no details. As I sat there, my thoughts were on the disaster plan we had on the books. I tried to recall what I had read. I couldn’t even think because some yahoo seated nearby was complaining to anyone who would listen how he was going to make PSA pay for having him miss the previous flight. I wanted to get up and shake him and tell him the previous flight out of Sacramento was 182. “Everyone was going about their business efficiently when I got to PSA’s PR offices,” Hastings says. “There was tension, but it came from grief, not lack of preparation. Duane Youngbar allowed the media into our war room as long as they didn’t get in the way. When we had information, the media had the same information. “With the arrival of the computer age, many important safety strides have been made in the airline industry. It’s hard to pinpoint which ones are the most important,” Hastings says. Fire Chief Robert Osby thinks technology has helped to fine-tune disaster preparedness. “I learned a lot from the PSA crash. Back in 1978, we had local police and fire officials, federal, state and airport agencies all with separate command centers. Now we’re more centralized. More time can be spent on efficiently saving lives instead of fighting confusion.” Why is the loss of 144 souls in one plane collision so poignant when more people die—about 35,000 a year—in traffic accidents? Britton says Steve Howell felt guilty accepting praise and honors for covering a story when so many people died. “I told him there will always be accidents, and there will always be reporters and photographers covering those stories. We just happened to be there when it happened. exploded west on to Dwight Street (where cars are parked. To this day no memorial is located at the intersection. at the North Park branch library a mile from ground zero. “Understanding that has made me a better reporter. I came to know I need to be more sensitive when covering news stories, especially those involving human tragedy.” September 25, 1978, was one of the first major disasters captured so quickly and so graphically by the media. In many ways, coverage of that story began the long litany of real-life horror that too frequently plays on our TV screens. Television brought the Vietnam War into our living rooms. 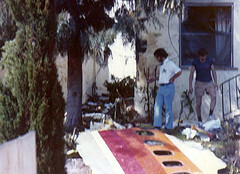 The collision of PSA’s Flight 182 and the Cessna 172 brought a huge domestic disaster home. It hurt us all—until September 11, 2001. Thomas Shess, a contributing writer to and former executive editor of San Diego Magazine, was also editor of PSA California Magazine, the in-flight publication during the 1970s. He is a native and resident of North Park and founder of the North Park News. THE BREWSPAPER / ICE CREAM BEER—REALLY!